​​​FORT BEND – Colliers International has released its 3Q 2016 Fort Bend Snapshot report, below are some highlights. The Fort Bend office submarket posted 72,721 sf of negative net absorption in 3Q 2016. The average vacancy rate increased 120 basis points (bps) from 8.9 percent to 10.1 percent between quarters, and increased 130 bps from 8.8 percent in 3Q 2015. The average quoted rental rate remained flat over the quarter and marginally decreased 0.3 percent from $25.75 per sf in 3Q 2015 to $25.68 per SF. The vacancy rate decreased 40 basis from 14.7 percent to 14.3 percent over the quarter and increased 200 bps from 12.3 percent in 3Q 2015. The average quoted rental rate remained flat over the quarter and marginally decreased 0.3 percent from $25.75 per SF in 3Q 2015 to $25.68 per SF. The vacancy rate decreased 40 basis from 14.7 percent to 14.3 percent over the quarter and increased 200 basis points from 12.3 percent in 3Q 2015. 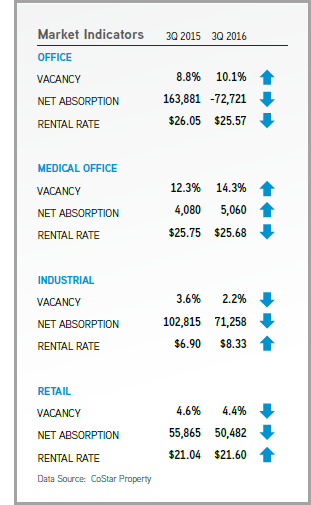 The average asking rental rate for the Fort Bend retail submarket increased 5.9 percent between quarters from $20.39 per SF to $21.60 per SF and increased 2.7 percent from $21.04 per SF in 3Q 2015. The submarket recorded 50,482 SF of positive net absorption in 3Q 2016 and the vacancy rate decreased by 20 basis points over the quarter.